Since the Ming Dynasty, Shark Fin soup has been considered a delicacy because of the decadent feel of preserving the meat. This thought has been traditionally kept into our modern age as a high status symbol. Most of mainland Chinese and Hong Kong say that having shark fin soup at an important meal helps preserve ‘face’ because of its traditional ties. However, the young campaigners to stop shark fin soup have relieved many consumers their ignorance of how exactly the sharks fins are acquired. For the most part, Sharks are hunted, taken in to cut off their fins and then thrown back into the water. Sharks cannot swim or defend themselves without the use of their fins, leaving them helpless. Between 2006 to 2011, 9,400-10,00 metric tons a year of prepared shark fin was imported. The results showing now, that the shark species has declined between 60-70%; threatening extinction. I believe the activism from younger Chinese generations is because they have not been conditioned as much to view Shark fin soup as high of a status compared to the older generations. They are more receptive because of the awareness around the issue. This activism has also led to a drop in demand, so the turnover rate for shark fin soup is slowing down. However, less than 5% of consumers chose the option from Shark Fin Soup. So it is still an issue that has the valued tradition conflicting with modern ethics. It is very easy to condemn the Chinese for their practices over attaining shark fin soup. However, do we not have traditions that are considered unethical in Canada today? · Canadians put a high enough value on beavers that we represent them in our currency, yet we have been skinning them for hats for years. Then the meat goes to waste. · Boiling Lobsters alive in restaurants. · Slaughter cows alive & upside down to remove blood efficiently. · Extinction of Longjaw Cisco due to over exploitation by humans and sea lampreys. Last seen in 1975. Have we even considered changing them because of foreign beliefs? We have a culture of exploiting species in nature. Humans, for years, have taken species from the water without any regard for future generations. People in the past have usually taken from the water to feed themselves, tradition or the consumer demand from business. Chinese culture has Shark Fin Soup as a fundamental stitch in their traditions. Why do we think that we have more superiority to change their values and not our own? The simple underlying truth of it all is that religion is not ‘right or wrong, it just is’. The concept of tradition is the practice of religion itself and we cannot condemn the Chinese unless they see fit to change the tradition themselves. Tradition vs. Foreign Ethics: Is there a solution? Within China and Hong Kong there is businesses that rely on the tradition of the Shark fin soup sales to make a profit to survive. There is also a social preference that the purchase of the soup maintains face in important events. Furthermore, there is a fraction of a younger generation that wants an alternative option to Shark fin soup because of the westernized influences in their lives. I feel that there is a possible business solution to this that can maintain the balance of tradition, keep business alive to feed families in the industry and to help shark activists to have a little peace of mind. · Traditional values can be more powerfully stated because the amount of Shark Fin to attain is harder to get. · For some Chinese people who want to look towards change in their traditions, they can have different food on the menu to gear towards a different target market without sacrificing their business. 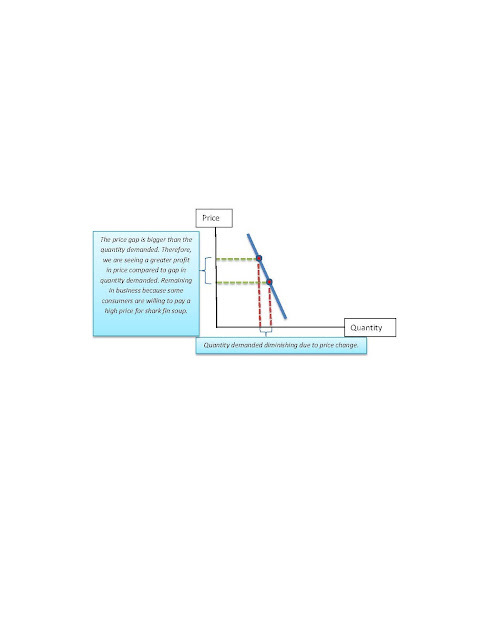 This example solution is based on theories that I have learned in Microeconomics. It is not a sound solution because there are always political and cultural influences that may affect the outcome. However, for people wanting to be ethical business professionals, we need to find innovative ways to keep business, people and our environment alive around us even if it starts with one simple idea. We need to change because we should not allow ourselves to be bystanders when a species is on the verge of extinction or when a culture is mocked. We all have entered into this Global village, and for better or worse, we all need each other now if we want the next generation to be as interconnected and educated as we are today.